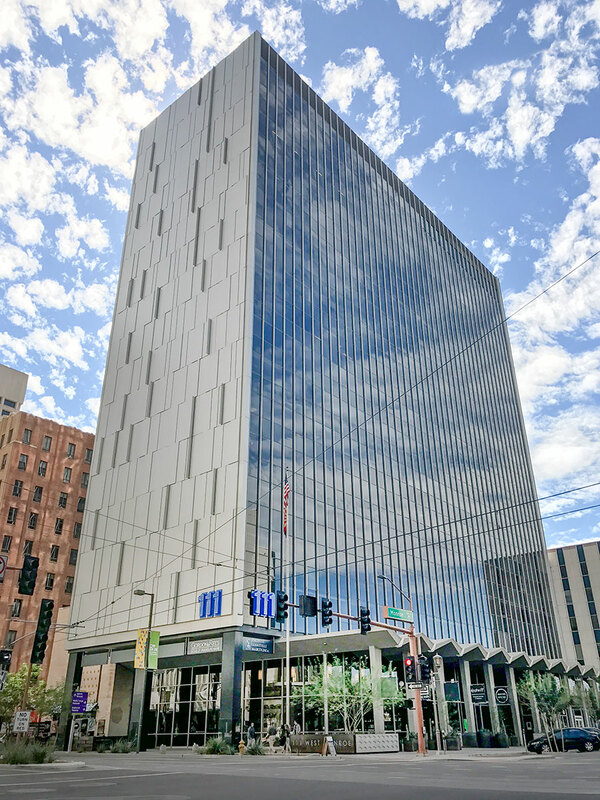 111 West Monroe, aka the Monroe Building, is a remarkable example of a highrise in Phoenix that also meets the needs of pedestrians down below. 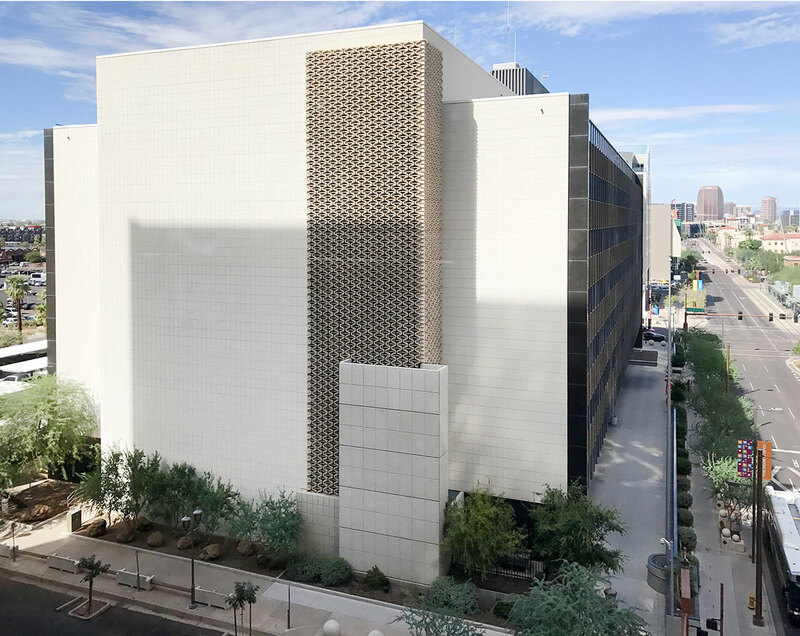 Originally the AZ Title and Trust building, it's one of the Top 25 Eligible yet Unprotected Commercial Properties in Phoenix, notable for its Miesian approach to expressed materials and contribution to the community through interaction with the street. The folded-plate roof and colonnade of the first floor shelters floor-to ceiling windows used for retail display and interior illumination. 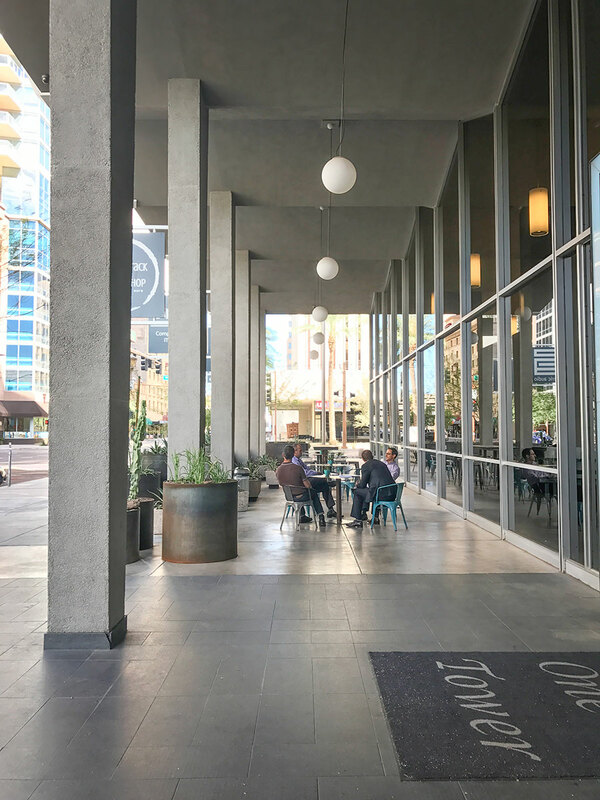 Businesses such as a wine shop, pilates studio, pub and high end audio retailer inhabit the ground floor, activating the space. 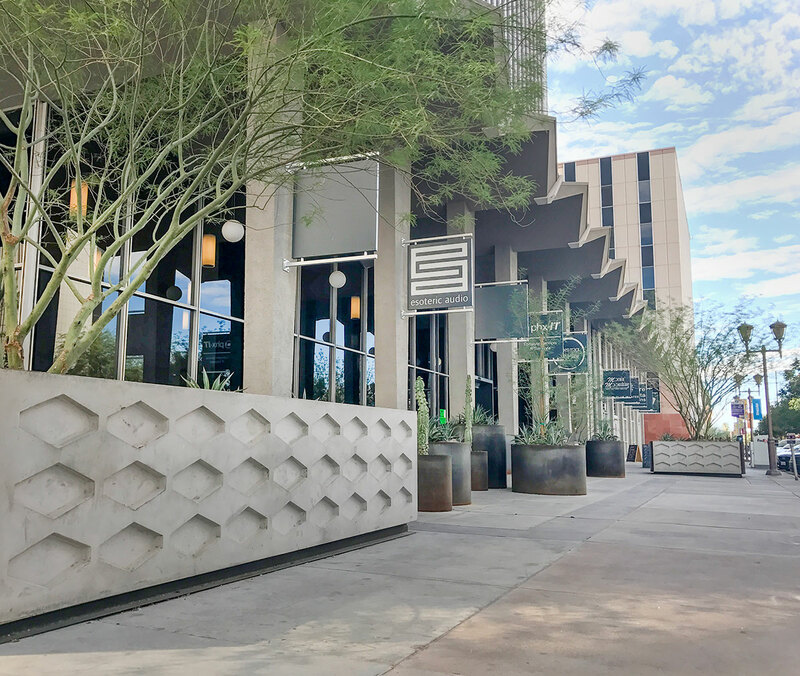 Cast concrete and steel planters with hexagon shapes help create a friendly and green streetscape. Informal shady public spaces and plazas like those at 111 West Monroe are desperately needed throughout the city. 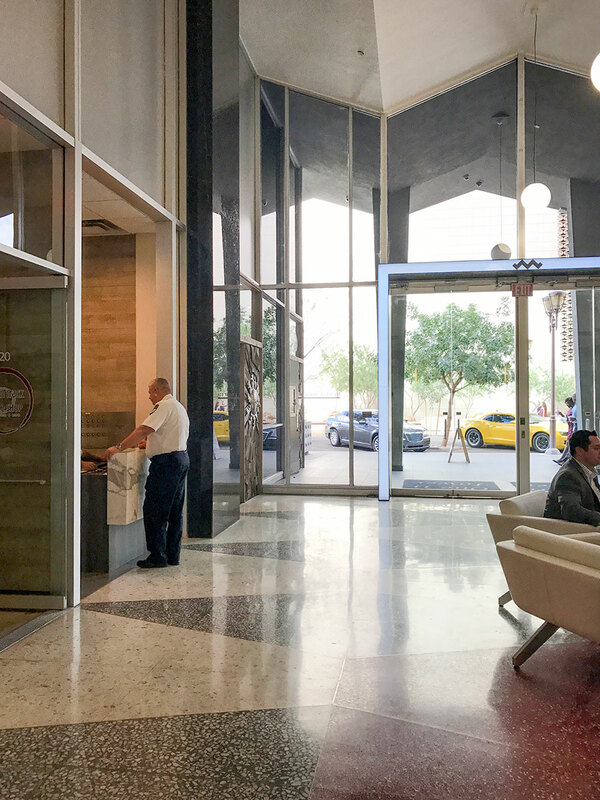 So is free parking, which is often available along Monroe for those who visit with a quick in-n-out. 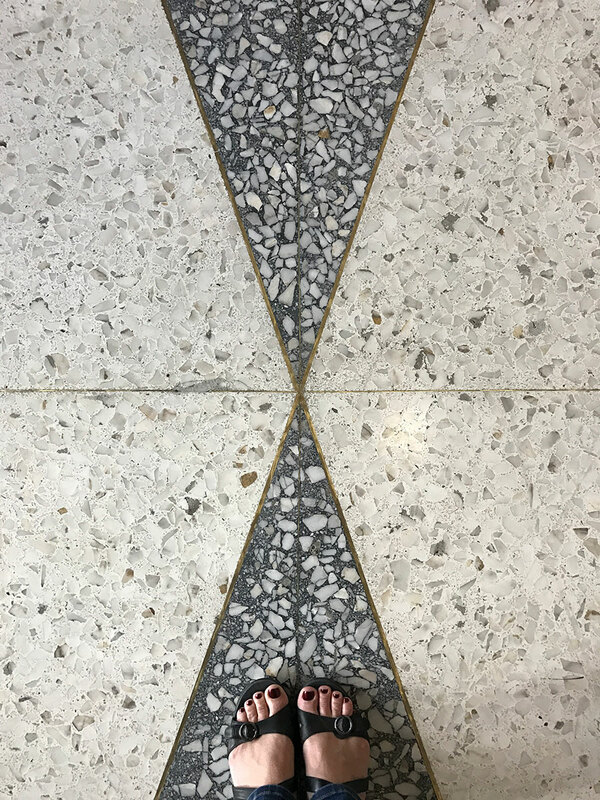 Brazilian terrazzo flooring in the lobby echoes hexagon shapes. 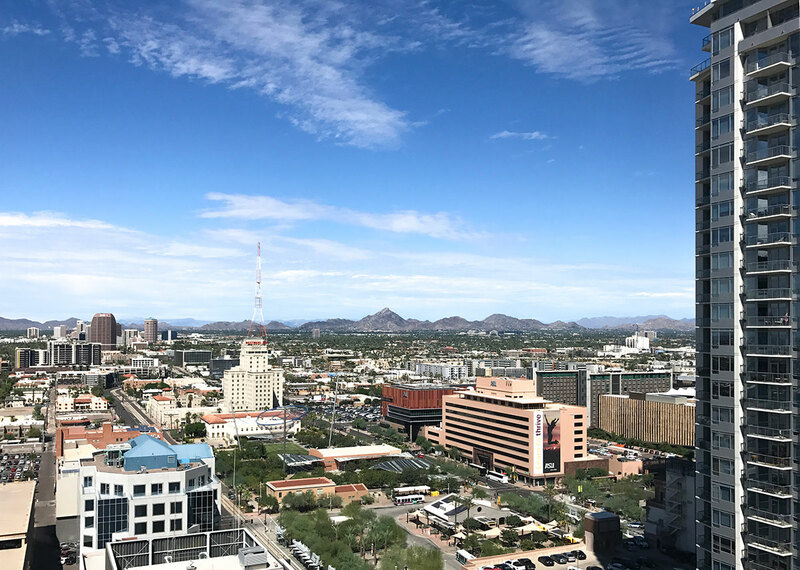 Offices in the tower offer a beautiful northern vista of the Westward Ho building and CityScape Park. Great views of the Bankruptcy Court grille as well. 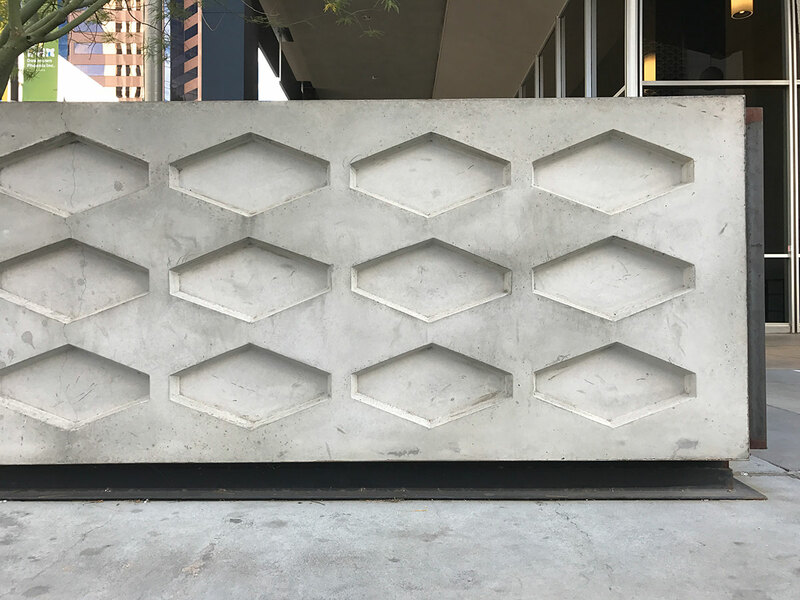 The concrete planter shapes in the streetscape mirror the hexagon motif to create continuity. 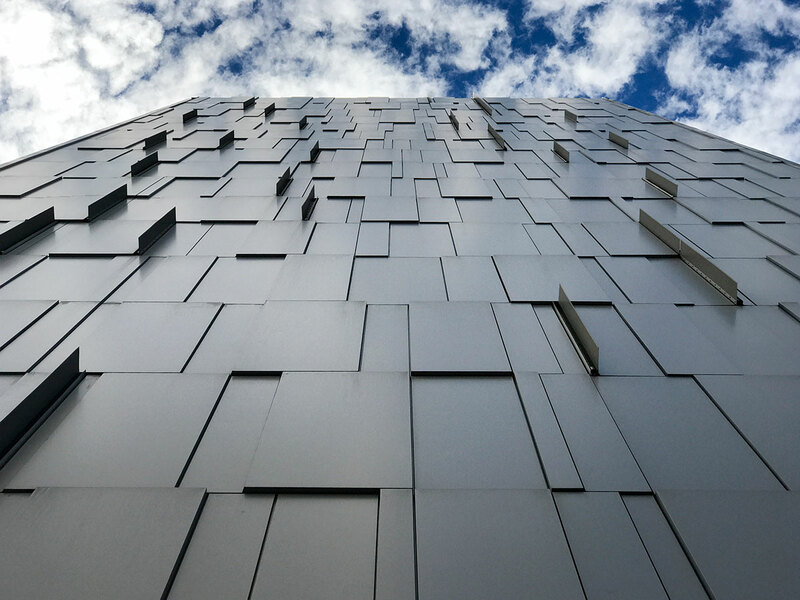 Architect Will Bruder added the panels and animated LED display to the east and west sides of the building. The lights drip down as they change color. According to Don Ryden in Midcentury Marvels, there were once exactly 8,496,218 one inch ceramic tiles in their place. The streetscape is well illuminated, creating a safe and lively place to walk while attending events downtown. 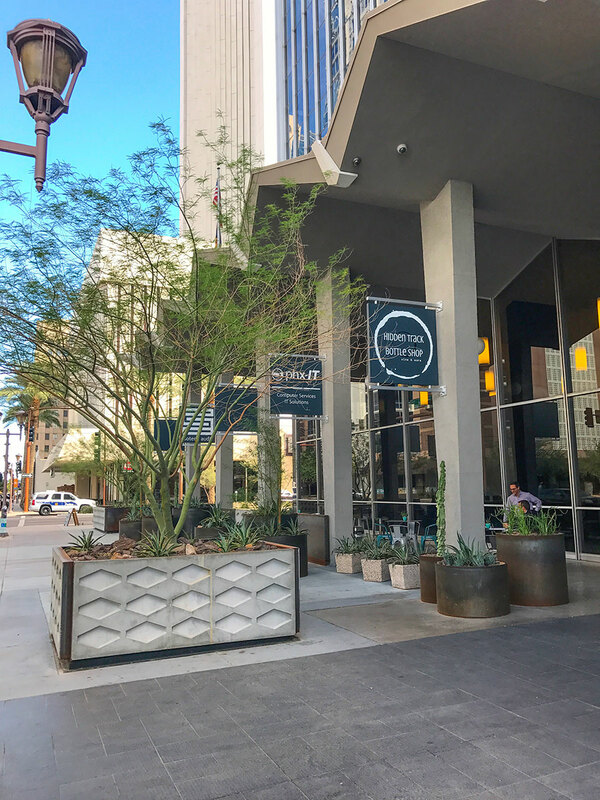 Developers in Phoenix should note and leverage of all the subtle and humancentric touchpoints that make a highrise a cultural and quality-of-life asset to the community, starting with the preservation of existing architecture. 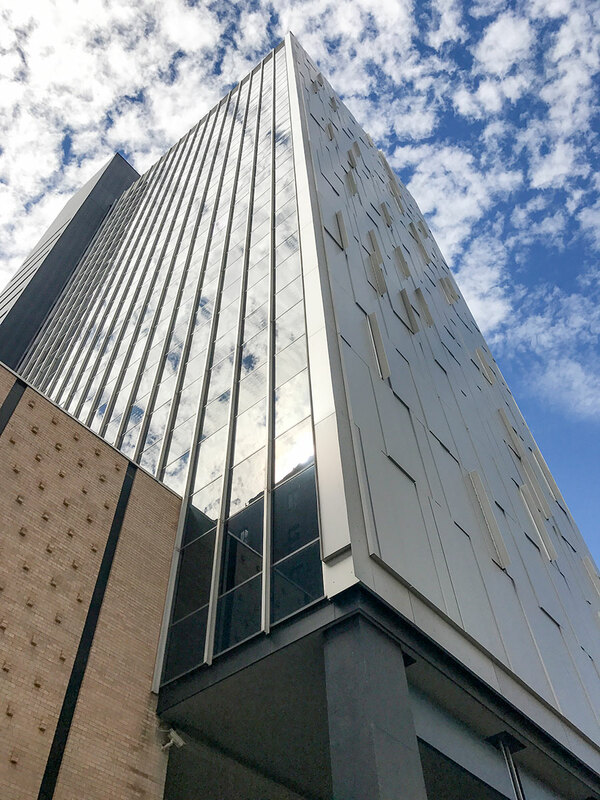 Since the building is well over 50 years old and is standing strong, we urge the owners of The Monroe Building to seek historic designation at both the national and city level. 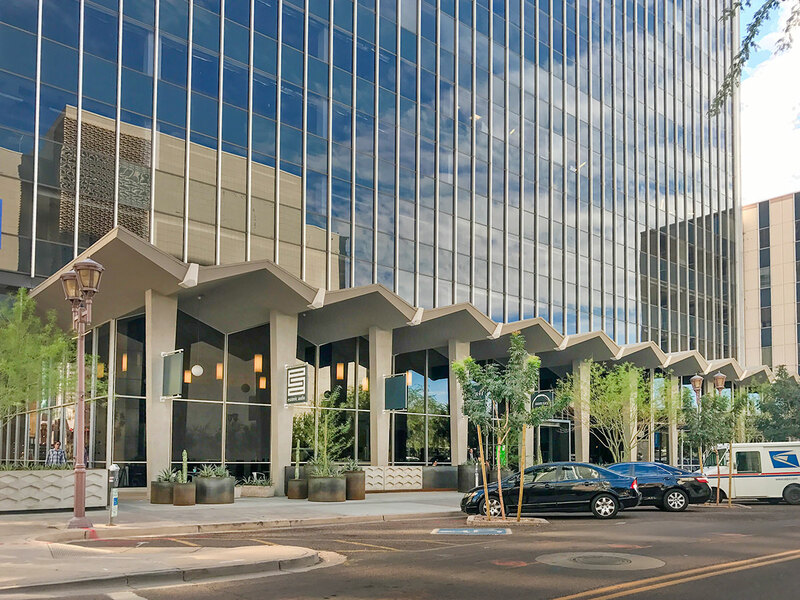 Despite its magnificence, it is one of the Top 25 Eligible yet Unprotected Commercial Properties in Phoenix.